The on-line training module for GPs, originally produced in 2014, with the Royal College of General Practitioners, has been updated in May 2018. This is available on the RCGP website and attracts 0.5 CPD points. It is still available free to all health professionals. To help spread awareness, please consider printing either one or both pages of our flyer describing this course and drop it into to any minor injury unit or GP Practice: wherever you think there is a doctor, nurse, physiotherapist etc who would benefit. Pharmacies, too, as they are often consulted about “funny rashes”. You will note that it has pictures of two different versions of the rash – just seeing this should catch a GP’s attention! with the name of the Practice/Centre/Pharmacy etc and (if you can) the postcode. We’ll add it to the map below. This is your opportunity to spread awareness! 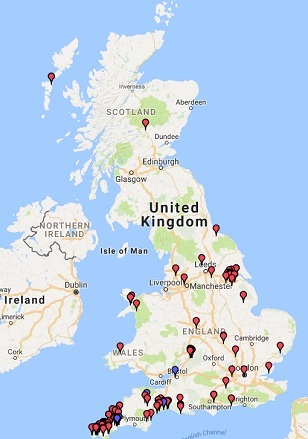 Enter your postcode to get a map showing where leaflets have been distributed in your area.